Though planet-studying spacecraft usually cost millions, or even billions, of dollars, every penny helps. That's the reasoning behind the Planetary Exploration Car Wash and Bake Sale to be held by University of Central Florida students and professors who hope to sway lawmakers into providing more money for studying the solar system. It is one of nearly 20 planned demonstrations for Saturday at sites across the country, organizers said. "We're not asking for more of the pie, we're asking for less of a bite out of the pie," Laura Seward, a graduate student at the university who organized the event, said in a statement. "A strong robotic planetary exploration program is essential for a strong human planetary exploration program." Like many federal agencies, NASA is strapped for funding under the current fiscal conditions. Just today (June 7) the space agency announced the cancelation of a new X-ray space telescope mission, the Gravity and Extreme Magnetism Small Explorer, because it is over-budget. The University of Central Florida's bake sale is part of an overall effort sponsored by the Southwest Research Institute in Boulder, Colo., to fight against the proposed budget cuts. Other organizations planning to participate in the demonstrations include the Search for Extraterrestrial Intelligence (SETI) Institute in Mountain View, Calif.
"The nation risks the loss of a generation of upcoming, talented engineers and researchers whose careers are centered on the exploration of our solar system in the quest for life beyond Earth," said astronomer Jill Tarter, the outgoing director of the Center for SETI Research. 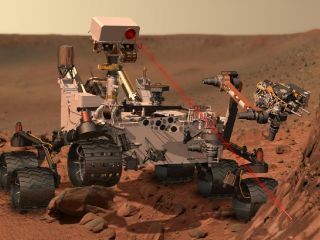 NASA has a number of ongoing planetary science missions, including the Cassini orbiter around Saturn, the New Horizons spacecraft on its way to Pluto, and the Mars Science Laboratory rover Curiosity, due to land on the Red Planet in August. The agency also has a number of missions under development, such as the OSIRIS-Rex asteroid sampling mission due to launch in 2016. Yet the number and scope of projects NASA will be able to undertake in the future could be seriously hampered by the proposed cuts, scientists say.